Fast, long-lasting results. PolyLevel® can fix an uneven road. highway or bridge approach quickly, effectively, and with little inconvenience to the public. Settlement of highways and roadways is a problem that Departments of Transportation across the country are tasked with correcting on a regular basis. As expansion joint materials break down over time and allow water to penetrate below the slab, and the subgrade below the concrete compresses as a result of heavy traffic flow, sags often form in the roadway. These sags create difficult and unsafe driving conditions to the general public. Bridge authorities face similar issues when dealing with the settlement and misalignment of bridge approach slabs. Often, these approach slabs are supported with backfill material which is both loose and poorly compacted. The stress and constant vibration the slab encounters during daily traffic compresses this fill material, thus creating voids below the concrete. As a result, many bridge approaches settle to the point where they are no longer within tolerance of what is considered a safe and acceptable gradient. The PolyLevel® system offers a long-lasting solution to repair sinking highways, roadways, and bridge approaches, while also providing many benefits that alternate options fail to achieve. While traditional methods of repair such as diamond grinding or removal and replacement of the concrete have been used in the past, these solutions are often temporary, cost prohibitive, time consuming, and fail to address the underlying cause of the problem - the soil beneath the slab. With the PolyLevel® system, city and state agencies are able to correct the problem quickly, effectively, and with little inconvenience to the public. 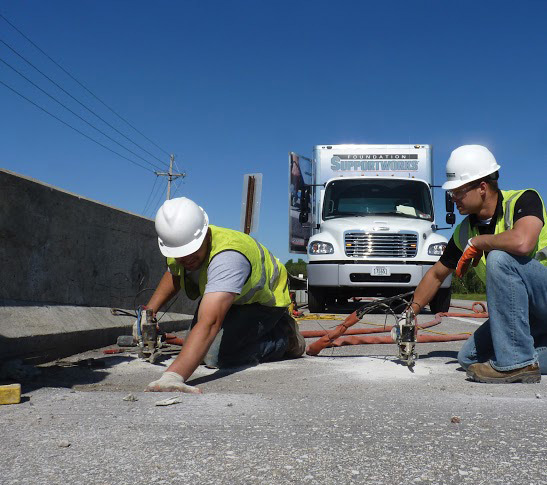 With its quick cure time, high compressive strength, and efficient installation, PolyLevel® is often installed without having to completely shut down the roadway or bridge, allowing traffic to continue to flow without any major disruptions. PolyLevel® can be used for a variety of commercial concrete leveling applications, including installing pipelines, repairing commercial building slabs, as well as for repairing airport runways, railroads, and more. Call us or contact us online to setup a consultation with your local PolyLevel® dealer.